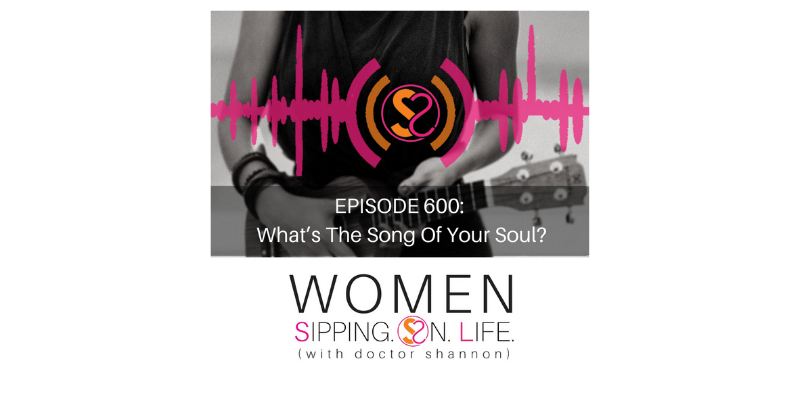 EPISODE 600: What’s The Song Of Your Soul? My hope is that you will look back on today — that WE will look back on this day in history — and say, that was an historical (HERstorical) day! Today’s the day we’re going to do that. What do you say? #1 – YOU. For being here and listening. Whether today’s your first time sipping on life with me, or you’ve been here since the beginning, or joined us along the way. THANK YOU!!!!! You have no idea how much you inspire me to keep sipping and sharing. #2 – My dear love, Pablo. Thank you for all your love, encouragement, and selfless support. #3 – All the heartache and pain my heart and soul have GROWN through. I wouldn’t have so much to say if it wasn’t for the many stories of healing written on my heart. Thank you, God! #4 – The SONG in my soul. Then that keeps singing a hopeful, inspired tune…and keeps inviting me to continue going deeper in the romantic S.O.L. ADVENTURE. What is the SONG of your soul? Let’s find out with this S.O.N.G. S – What SCARES you? O – What seems ORDINARY to you because you think it’s common? It’s not. Look deeper, and further. What’s beyond the horizon that you can currently see. G – What GIFT(S) are in you that require your gratitude? If you were really grateful for this gift, how would you SHOW IT? How would you SING IT? Sit down and allow your heart to sing her song to you today… What is your heart showing and telling you? 1. What you discovered today. 2. What would you like to hear in the coming episodes? 3. How has the podcast affected your life? Please share with us your S.O.L. Story. 4. Please leave a rating and review on iTunes or Stitcher. I’m giving away 2 books today. One for you and one for your S.O.L. SISTER. I’m also going to choose 1 lucky soul to give the gift of a 1-on-1 Healing Life Coaching session. Thanks again for being part of this HERstorical Day as we celebrate 600 episodes of SIPPING ON LIFE.